Carmelo Anthony’s individual mentality the cause for team’s uneven play? Don’t look now, but the New York Knicks are up to their old tricks again. After dropping nine straight games (a losing streak snapped Thursday against the hapless Nets), coping with continuous headlines calling for Mike Woodson’s head and even some trade rumors surrounding their costly roster, the Knicks won two games in a row and it looked like the season might be turning around a little bit for New York. Instead, the Knicks did a complete 360 back to their nine-game losing streak Sunday afternoon against the Celtics. "It's a step backwards. I thought we had turned the corner somewhat," Woodson said on Sunday after the Knicks were trounced by the Boston Celtics, 114-73 at Madison Square Garden. "I can't have our guys stepping on the floor doing what they did tonight." New York sits at 5-14 on the season and will keep taking shots in the press until they figure out a way to dig itself out of this deep hole the team has dug this season. 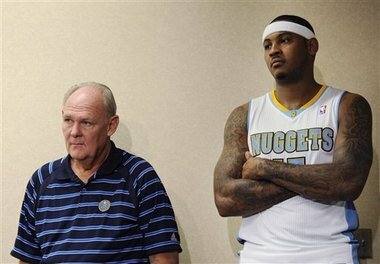 And while the Knicks early-season demise this season does not fall completely on his shoulders, that outlook resonates and lingers when reading the comments by Anthony’s former coach with the Denver Nuggets, George Karl. "Melo is not a totally selfish player. I call him an individualist. He's a scorer. That's what he makes his living doing,” Karl commented on ESPN’s “SportsCenter”. "He, at times, is difficult to coach and sometimes difficult to play with. But in the same sense, he does produce success and winning; he just does not produce championships." "A selfish guy is the one who knows he should be doing something and doesn't," Karl said. "Melo knows the game of basketball. He's not a low-IQ player." Consider the numbers: On the season, Anthony is averaging 25.9 points and 9.9 rebounds per game, and during New York’s losing streak, Melo averaged 28.5 points while taking 23.2 shots. 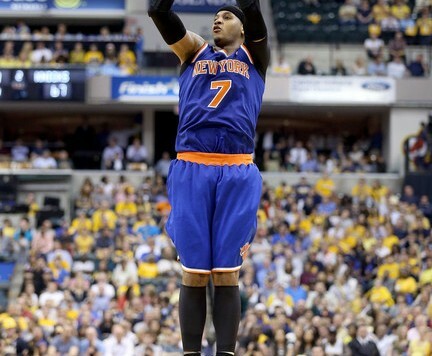 In New York’s two previous wins, Melo took 24 total shots. Prior to that in losses to New Orleans and Denver, Anthony put up 43 shots, prompting him to say he wanted to try something different in defeating Brooklyn and Orlando. Now after a decade in the NBA and competing on an All-Star level, Anthony is still learning what works and what does not. It is not so much about him scoring 30 points or getting his scoring production — it is about how he goes about it. On Sunday, Melo stuck with the “less is more” philosophy with 15 field goal attempts in 32 minutes, on his way to 19 points and 5 rebounds. He also stayed aggressive and went 8 for 10 from the free-thrown line. It does not take a genius to realize that no matter how bad things get in New York this season, Karl is not waiting in the wings to take over for Mike Woodson if Woodson gets a pink slip. In other words: neither Karl or Anthony will be producing a championship together. But how about 10 million?